Sometimes, if you want to get the most out of your treadmill workout, you need to be creative. Running at a set speed for mile after mile and day after day is only going to get you so far. Instead, try to mix things up and use these 10 tips to give your treadmill workout a calorie-burning, muscle-building, endurance-making BOOST! Make sure your body is ready to workout. First things first! If your hydration level and nutrition pre-workout aren’t up to snuff, you’re not going to reap the full benefits of your time on the machine. We spoke with Jason Yates, a fitness trainer from New Jersey, to get his take on pre-workout nutrition. “You need to make sure you’ve eaten enough carbohydrates before your run. Also, be very aware of how much water you’ve had to drink throughout the day. This will help your body run as hard as it can,” he explained. He went on to explain that symptoms of improper nutrition and dehydration include muscle cramps, head aches, early fatigue, and a feeling of exhaustion much earlier than normal. 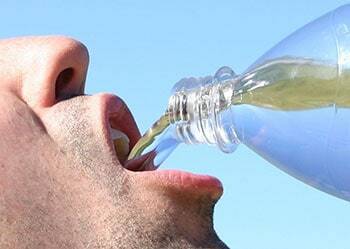 We recommend you drink at least half your body weight in ounces throughout the day. Pick the right music to amp things up. Music can have a huge impact on the quality of your workout. Studies have shown that the right tempo can actually increase your performance and lower your rate of perceived exhaustion. Use online tools to generate a playlist that is perfect for your particular running cadence and speed goals. Pick a buddy and take turns setting the pace, incline, and type of exercise. This will ensure that you are varying your workout constantly. Don’t go easy on each other. If your friend just demanded two minutes at the highest incline setting, you can get your revenge with ten 30-second sprint intervals! This technique is much more fun and will help you get a more intense workout. Plus, High Intensity Interval Training (HIIT) workouts have proven benefits that can aid in weight loss! Some machines, like the NordicTrack x22i Incline Trainer, come with a set of weights to add an extra element to your workout. You may try holding these weights in your hands while you walk on the machine. Use caution with this technique though. If you are unsure of your footing, it may be a better idea to hold onto the rails and leave the weights for later. An even better idea is to wear a weighted belt or vest. When your body is heavier, it is going to take more effort to move your mass. Therefore, you’ll burn more calories! Wanna mix things up even more? Try walking backwards uphills on your machine. Go slowly and hold on to the hand rails for balance. This technique will work your quads, glutes and calves. Plus, it will help open up your hips and counteract your week of sitting at a desk. You may also try a slow side shuffle or grapevine during your warm-up. Set the machine between 3-5% and use this technique to open up your hip adductors. Do High Intensity Interval Training (HIIT). HIIT treadmill workouts are becoming more and more popular since they have been proven to get results fast. The basic idea is that you do an extremely intense short interval on the machine followed by a recovery period. Several of these intense intervals back-to-back help ramp up your metabolism and create Human Growth Hormone naturally to help you lose burn more calories throughout the day. 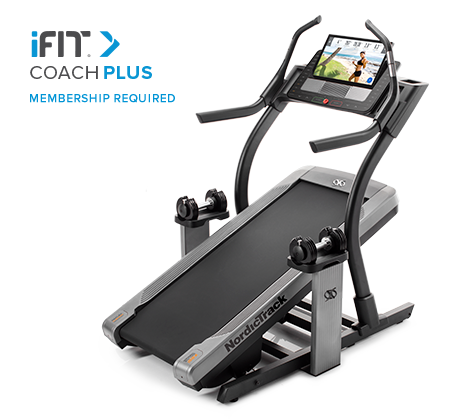 Several treadmills have HIIT programs built into their programming including the Sprint 8 program from Vision Fitness. You may also want to try the incredibly effective Max Trainers from Bowflex. These machines aren’t actually treadmills of course but they are specifically designed to provide HIIT workouts where you can really push your body to the max! Treadmills can be great tools to use at the gym. But who says you can’t use them in the office too? 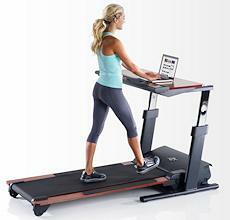 A treadmill desk allows you to walk slowly along while you do your regular day’s work on the desk top surface. The advantage to this system is that your body is avoiding a day of sitting still in a desk chair. There are a number of health hazards associated with prolonged sitting including diabetes, circulatory issues, and back pain. Do yourself a favor and check out the treadmill desks from NordicTrack or LifeFitness for a healthier day at work. Ditch the hand rails on incline! Wouldn’t it be nice if every hill in the world had a rope pulling you up so you didn’t have to work so hard? That’s not realistic though, so it doesn’t make sense to let yourself cheat that way on a treadmill. When you set the incline to extreme angles, don’t allow yourself to hang on for dear life while you walk. Many people make this mistake, but they are doing themselves a disservice. If you want to get the most out of this type of treadmill workout, let your legs do the work and ditch the handrails. Play around with the incline or hill preset programs. To simulate flat running outdoors, you should really set your machine to a 1% incline. This will add in enough resistance to account for the uneven ground and wind resistance you would encounter outside. Don’t stop there with the incline. Hill work will activate different muscles in your legs for a better overall effect. The best thing about treadmills is you can run uphill without having to run back down! Running downhill is often a cause of soreness and impact injuries on the calves and knees. Take advantage of Virtual Programming. In this day and age, treadmill technology is pretty outstanding. Use the new Bowflex Run Social programs to meet up with your friends all over the world for virtual runs in exotic locations. Use the synced Google Maps on the iFit platform to explore real life terrain all over the planet. Sync your workout goals and stats with your existing fitness apps like MyFitnessPal and Apple Health using the Sole Fitness Bluetooth technology. Each one of these programs will add flavor and excitement to your workout for a better motivating and interesting time on the machine. Check out our top Best Buy Treadmill recommendations!